Words and photos by Julie WeinbergerRails are always fun. Rails on government property are more fun. 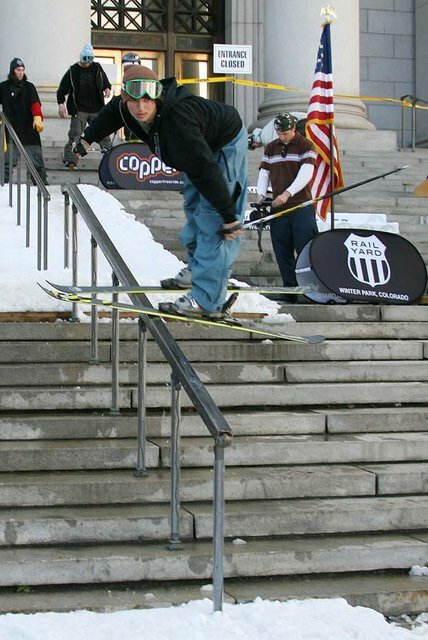 Just ask members of Copper and Winter Park’s freeride teams who were given the chance to hit a rail in front of the Denver City and County Building on Friday, Nov. 3.“An urban rail in front of the City and County Building, and we’re not getting fined,” said Copper team rider Erin Young. “It’s pretty nice that the city is letting us hit their stuff.”But how do you go about getting permission to hit a rail on government land?Winter Park is owned by the city of Denver, that’s how.“That makes it a little easier to navigate through the process,” said Terrain Park and Youth Marketing manager, Bob Holme. 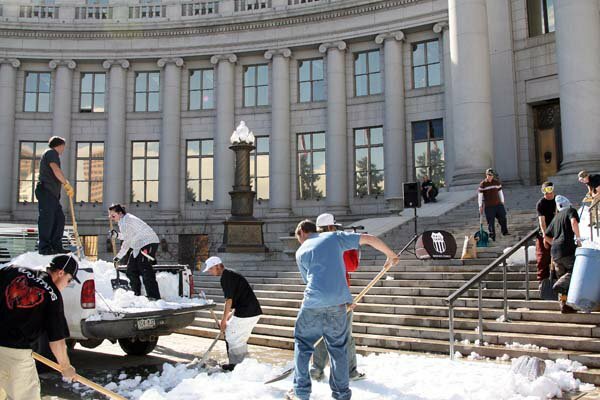 “This is the second time we’ve done something like this and everybody was really comfortable with the steps we take to protect property and the integrity of the area while have something really cool and unique.”The morning started off with the Copper pick-up truck dumping snow at the top and bottom of the rail. By 12:30—under sunny skies and 70-degree temps—a super-duper in-run and landing pad had been sculpted, and it was shred time. Lots of shoveling was needed to get everything perfectly set up. Not only was Copper team rider Erin Young the only girl shredder out there, she was also the sole tele skier.For about 20 minutes, the 10 or so skiers and riders got warmed up. Skiers included Taylor Seaton, Luke Nutting, Bobby Haupt, Ben Anderson and Young. 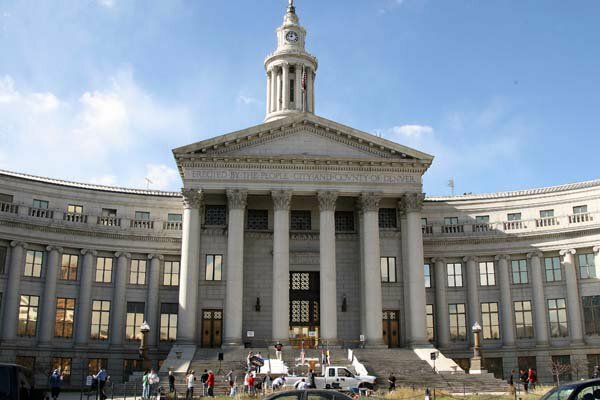 Then, it was time to listen to Denver’s mayor, John Hickenlooper, address the crowd of around 75 people from the steps of the City and County building. He talked about how skiing has changed since he was a teen, and how wonderful it is that the sport is growing in all sorts of directions. He also said Denver Parks and Recreation is opening up a mini-park at the Ruby Hill Park that will consist of six rails. 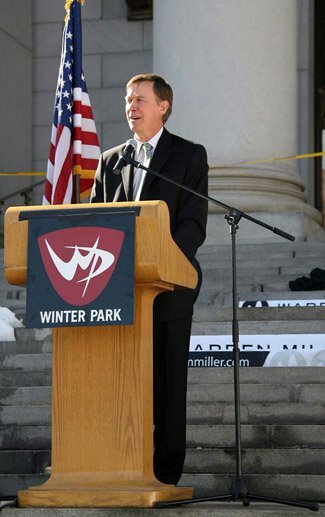 After Hickenlooper was done, a few other big shots spoke about Ruby Hill and this event.“We think we’re going to create something really great in a multi-cultural diverse neighborhood,” said Winter Park General Manager Gary DeFrange. “Our goal here is to introduce kids here to skiing and snowboarding and teach them what you can do, and then bring them up to Winter Park.” Then, it was back to slaying the rail. Reporters and spectators surrounded the area, many seemingly bewildered by the shenanigans. Since most onlookers had no idea what the difference in difficulty was between tricks, most the skiers stuck to straight slides and 270s off to make sure they stuck the landings. 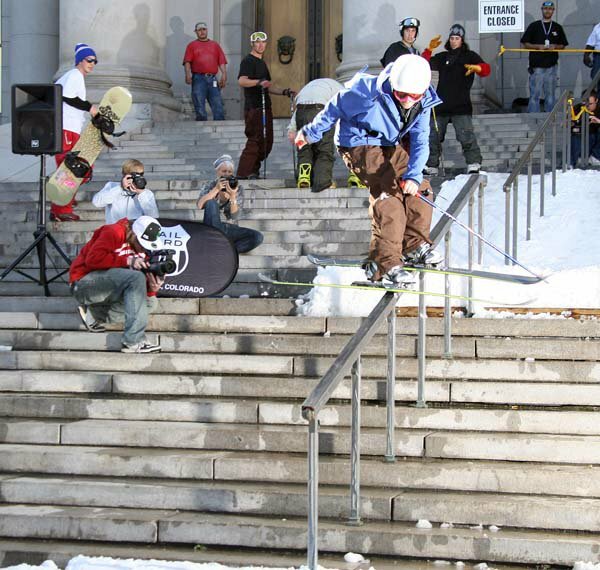 There was the occasional nose press and switch-up as well.In the end, the demo showed Denver what’s up with skiing, and allowed Parks and Recreation to usher in their Ruby Hill idea.As for the future of hitting rails on government property, maybe someday. “Well I wish we could always do this,” said Seaton. “I wish this was always legal.” Denver's mayor, John Hickenlooper. Robby Haupt with a nifty nose press. That's a lot of cameras pointed at Erin Young. 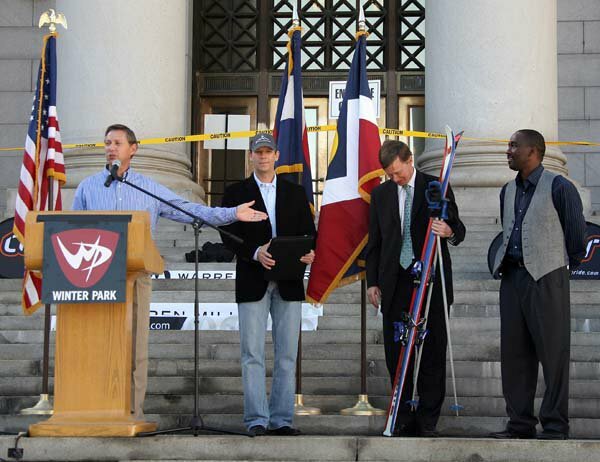 Winter Park’s Gary DeFrange makes sure the crowd notices how out of date the Mayor’s skis are. Winter Park rider Ben Anderson practices the tried-and-true method of maintaining rail balance: sticking out your tongue.